Cool and moist. Enrich with organic matter. A hardy biennial. Zone 3. Lovely. early color. Good naturalizer. Keep cool. moist. and out of direct sun. If happy. it will reseed itself and return for years. Mulch new seedlings over the winter. An excellent choice to accompany spring flowering bulbs. 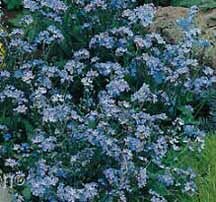 It is low growing (8 to 12 inches) with masses of blue flowers that appear from early spring and may persist into early summer in cool, moist conditions. In hot, dry locations the plants will quickly go to seed and the foliage will die back. Forget-Me-Nots should be spaced 10 to 12 inches apart. If the soil is poor, they will benefit greatly from the addition of well- rotted compost. Plants spread quickly and will self sow quite readily. Leave some seedlings to develop each year to ensure a continued supply of this biennial. Early flowering and neat habit make this an excellent complement to spring flowering bulbs. I place it in front of Leopard's Bane which enjoys the same soil and light conditions and flowers at the same time. The attractive blue and yellow contrast is very welcome in the spring garden.